An increasing number of American soldiers will die in a war that Congress authorized before they were born. There have been few concerted efforts to revisit the AUMF. The fact that Congress has barely even tried shows how legislators have abdicated their constitutional role on this issue. Just as dangerous however, is the way congressional inaction is enabling the increasingly disturbing arguments of the Trump administration with respect to potential hostilities against Iran. 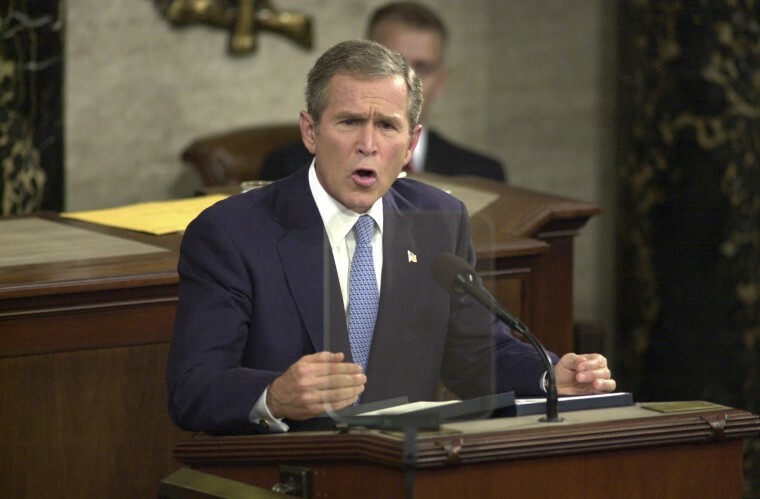 On September 18, 2001, President George W. Bush signed into law the AUMF, authorizing him “to use all necessary and appropriate force against those nations, organizations, or persons he determines planned, authorized, committed, or aided the terrorist attacks that occurred on September 11, 2001, or harbored such organizations or persons, in order to prevent any future acts of international terrorism against the United States by such nations, organizations or persons.” Although the Bush administration had sought broader and more open-ended language, Congress pushed back, insisting that the targets of military force had to have some connection to those responsible for the September 11 attacks. There have been few concerted efforts to revisit the AUMF. The fact that Congress has barely even tried shows how legislators have abdicated their constitutional role on this issue. Thus, despite misconceptions to the contrary, Congress pointedly refused to declare a “war on terrorism.” The use of force Congress authorized was instead directed at those who bore responsibility for 9/11 — namely, al Qaeda and the Taliban. It was also designed for a specific purpose: preventing those “nations, organizations, or persons” responsible for the attacks from committing future acts of terrorism against the United States. Nineteen days later, the U.S. military began offensive operations in Afghanistan under the AUMF rubric. Over the ensuing 17 years, the AUMF has been used as the legal basis for a remarkably broad array of military operations against a growing number of groups in a growing number of locations across the globe. As of May 2016, according to the Congressional Research Service, the same cryptic statute had been publicly invoked by Presidents Bush and President Barack Obama to justify 37 distinct military campaigns in at least 14 different countries. Some of the arguments in favor of applying the AUMF in new contexts have been uncontroversial, such as the claim that Congress did not geographically limit the use of military force against al Qaeda to the Afghanistan theater. But other extensions of the AUMF have been deeply contested, including the argument that the 2001 statute provides legal authority for the use of force against the Islamic State of Iraq and Syria (ISIS) — a group that, whatever its dangerousness today, did not exist at the time of the September 11 attacks. In other contexts, this kind of dispute between Congress and the executive branch would be resolved by the courts. But the federal courts in general, and the Supreme Court in particular, have historically been deeply reluctant to intervene in interbranch disputes over the scope of war powers, preferring that the political branches sort it out themselves. The federal courts in general, and the Supreme Court in particular, have historically been deeply reluctant to intervene in interbranch disputes over the scope of war powers. The one recent exception has been detention cases, but the U.S. military is currently detaining only one alleged member of ISIS (an unnamed U.S. citizen who has been held in Iraq since September 2017), and there is every indication that the government is trying to make that case go away without any judicial ruling as to whether the AUMF does indeed authorize his confinement. As a result, the only way for Congress to fix the AUMF is to amend it, something it has not done even once in 17 years. The fact that no such amendment has been enacted hasn’t been for lack of trying, though; Sen. Tim Kaine himself has spearheaded a number of bipartisan proposals, the most recent of which was co-sponsored by Senate Foreign Relations Committee Chairman Bob Corker, R-Tenn. Because three successive administrations have claimed that they do not need such a revision, however, passage of such a measure has never been a priority for congressional leadership of either party. But the more time passes without congressional action clarifying the scope of the 2001 AUMF, the more power Trump (and his successors) will be able to claim under that statute. The result will not just be a continuing drift in war powers from Congress to the executive branch; it will be the deaths of more American soldiers, an increasing number of whom will die in a war that Congress authorized before they were born.